How to Use: Model in a Bottle is easy to use. Simply apply your makeup as usual, allowing your mascara to dry completely. With your eyes closed, use 2-4 sprays of the Sensitive Skin Formula Setting Spray to set your makeup in place all day and into the night. Thoughts: I have really been enjoying this setting spray! I never used to use a setting spray because I never really thought it was necessary. I didn't think my makeup moved at all during the day (which definitely wasn't the case!) After I started using this setting spray, I quickly realized how different my makeup looked at the end of the day compared to what it used to look like without a setting spray. I love that all I have to do is spray this all over my face and my makeup will stay all day! The only problem I had when I first started using it was after I finished my makeup and sprayed my face, my mascara and eyeliner would run. I quickly fixed that problem by simply spraying my face before I applied eyeliner and mascara. I'm not sure if that's a problem everyone has or if it's just something that only I experience. 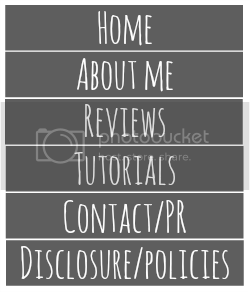 Either way, it's a minor problem and I fixed it easily by switching around the order of application. Price: $21 - You can find it on their website here. Give your brows a boost of staying power with Model in a Bottle Long Lasting Eyebrow Sealer. This Holy Grail product sets and holds both natural and made up brows. Whether you use pencil, wax, powder or go au naturel, your eyebrows will stay your way until you decide to take them off! Our dual applicator system lets you choose your preferred application method. Use the mascara wand for thicker, fuller, more natural brows or the brush for finer, more precise, made up brows. Only a small amount is needed to get the perfect brow and our formula will never dust, shine or flake. Model in a Bottle Long Lasting Eyebrow Sealer is easily removed with warm water and your favorite cleanser. Recommended for use on eyebrows only. How to Use: After your brow grooming routine, just use your favorite applicator to apply a small amount of Model in a Bottle Long Lasting Eyebrow Sealer. Your brows are good to go and will stay in place until you use your favorite cleanser to remove them! Thoughts: I've used many eyebrow products in the past but none have worked quite like this. Other eyebrow sealers or gels don't keep everything in place which leaves a few stragglers standing straight up making you look silly. I love that this product literally keeps every hair in place ALL DAY! It took a little getting used to because it feels like you hair sprayed your eyebrows in place - which feels a little odd at first. It's totally worth it in the end.. especially if your eyebrows have a mind of their own like mine do! Price: $14 - You can find it on their website here. This is not your Mom’s old fashion eyelash curler! Have model perfect long lashes with this cute and very compact eyelash curler. Its small but mighty design means you curl every single lash for a lush, flirty look! 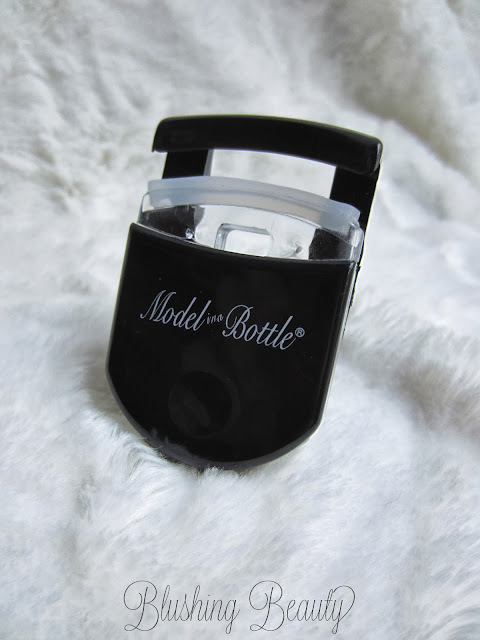 The Model in a Bottle Eyelash Curler fits perfectly in any make up bag and comes with a replacement pad. Price: $9 - You can find it on their website here. 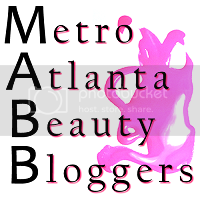 Overall, I really enjoyed all of the products I was able to test out! Model in a Bottle seems to really know their stuff when it comes to setting sprays and eyebrow sealers! They do have a few other products that you can check out as well: Original Setting Spray, Lipstick Sealer and Makeup Brushes. I may have to check out the lipstick sealer next! I highly suggest checking out this brand! I've never come across anything quite like these products! 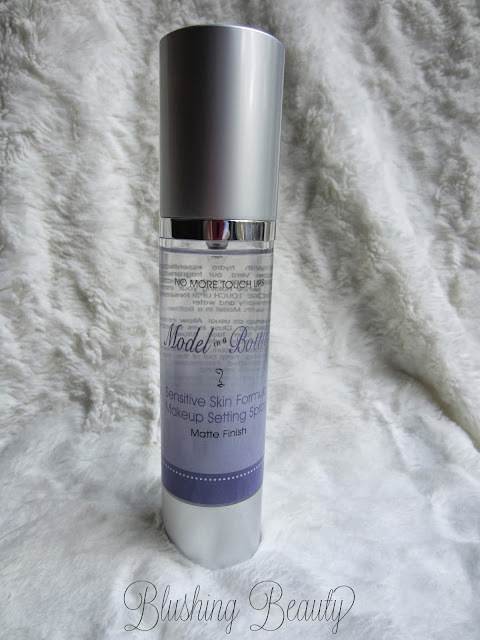 I have had Model In A Bottle makeup setting spray on my wishlist for a couple of years. One of these days I'm going to break down and buy it. It sounds phenomenal.